Mary Stewart has written a gripping gothic novel with a healthy dose of romance. Perhaps it is sensible to deal with the gothic aspects first: Mary has to balance on a perilous tightrope, convincing Annabel’s grandfather, the cook, groundskeepers, and servants who knew the dead heiress when she was growing up that she really is who she claims to be. At the same time, she finds Con Winslow and his equally scheming sister to be sinister. After all, when they first met in the countryside, Con threatened to murder her. He certainly seems capable of it, just as he might have killed his fiancée–Annabel–almost a decade earlier. Besides, who can trust a character named Con? Really. In addition to Mary and Con, Stewart has created a number of other compelling characters: the sweet young Julie, who was a little girl when Annabel disappeared; her beau Donald Seton, who seems to be more interested in archeology than marriage; grandfather Winslow, whom Stewart presents as a powerful man who struggles as he loses his strength and ability to control his household due to age and illness. Of course, the most interesting character is a late arrival of the Winslow’s neighbor, Adam Forrest. Chained to a mad wife, Adam had nevertheless fallen in love with Annabel, and she with him. When Adam–now a widower–reappears, Mary Grey’s disguise is in peril. As the eldest Winslow’s illness progresses and Adam Forrest threatens to reveal Mary’s secret, the tension in the house builds to a crescendo that may result in more than one murder. I can only say–without spoiling the novel–that the climax is highly satisfactory. As for the romance, it is hobbled by the fact that Adam Forrest appears halfway through the novel. Fortunately, Stewart provides us with enough potential love-interests and threatening men that the reader is kept guessing about who Mary will end up with. Is Con as scary as he appears? Will Donald Seton turn his attentions towards Mary? And is Adam a menace or merely a wounded lover? I found the chemistry between Mary and the hero to be quite good, and could easily have rated it higher (though I cannot explain why I didn’t without exposing elements of the plot). Romance is not the main focus of The Ivy Tree, but like any good gothic novel the tension between the heroine and her alternate suitors is central to the plot. Though I could have asked for a little more, I was satisfied by the romance. The edition that I read was published in 1963. Unsurprisingly, many of the characters are heavy smokers. Reading the book was like watching an episode of Mad Men. For me, the chain-smoking was a distracting turn-off. 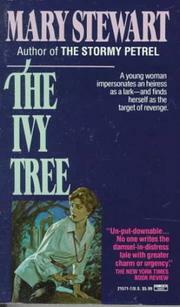 I had to remind myself that The Ivy Tree is a book of its era–now half-a-century in the past. I prefer to read period gothic romances, but enjoyed Mary Stewart’s book. I recommend it for fans of contemporary gothics who are able to overcome the disconnect between the modern setting and the seismic shifts in social mores since its first edition (1961).